Sold by EasyWayProducts and ships from Amazon Fulfillment. 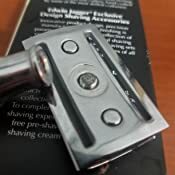 This fabulous traditional double edge safety razor is fitted with the latest precision manufactured Edwin Jagger DE razor blade head creating great interest among experienced wet shavers requiring a close and accurate wet shave with finished results comparable to the original straight cut throat razor. 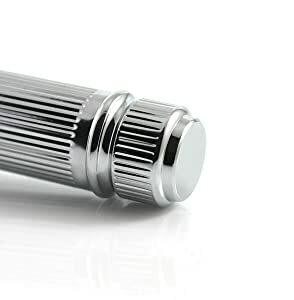 The classic closed comb head, expertly engineered caps the highly polished chrome plated solid brass tubular handle with the Edwin Jagger name embossed around the collar. With an Edwin Jagger traditional double edge safety razor you can achieve a very close shave helping to reduce ingrowing hairs. 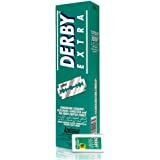 Each DE razor is supplied with 5 Derby safety blades so the razor is shave ready. 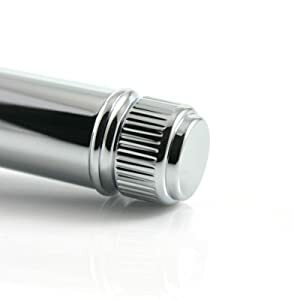 For over two decades Edwin Jagger has set the standard for impeccable male grooming. Established in 1988, a family owned and run business where innovation and inspired design go hand in hand. Edwin Jagger exemplifies traditional English quality and style combining it with state of the art design, up to the minute manufacturing techniques and the heritage of long established Sheffield craftsman skills. 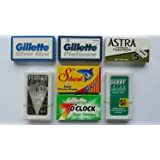 Edwin Jagger Limited is a global leader in wet shaving and grooming product manufacture. Shaving with the double edge safety razor is a pleasure. 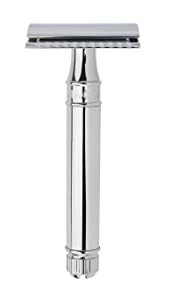 The handles are balanced, with a reassuring weight and feel, giving a satisfying close shave. The best shave is always achieved using good quality Edwin Jagger shaving cream and a Badger Hair Shaving Brush. 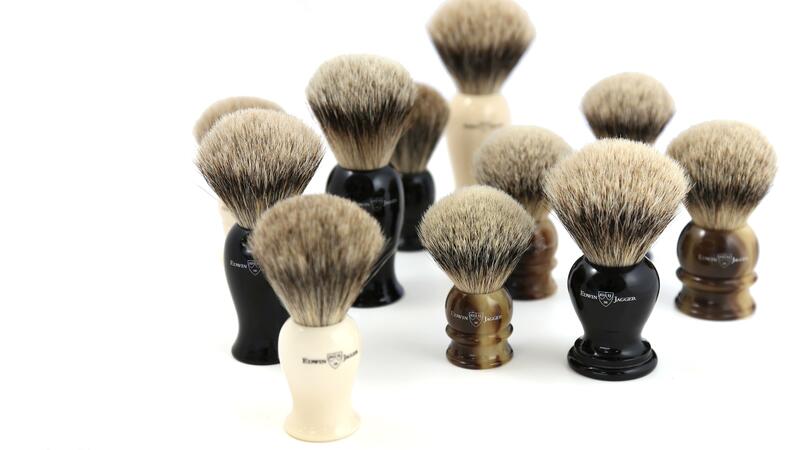 Matching shaving brushes are available for all our razors. Edwin Jagger is regarded as the foremost manufacturer of exquisite design shaving razors and shaving sets. Choosing only the finest materials and combining cutting edge manufacturing processes with age old skills of the craftsman we produce an unrivalled collection of traditional and contemporary styled razors, shaving brushes and shaving sets. 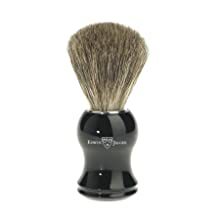 All Edwin Jagger shaving brushes are filled with the highest quality, hand graded badger hair from the badger species Meles Meles (a sustainable source). 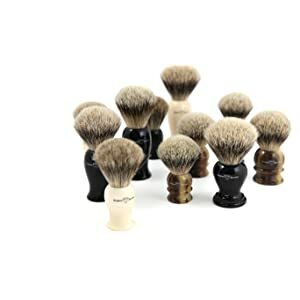 Badger hair has been used for more than two centuries to make the finest shaving brushes. 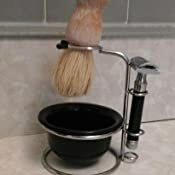 Rather than repelling it the hair absorbs water, and, when combined with a good quality shaving cream or soap, produces a rich shaving lather. 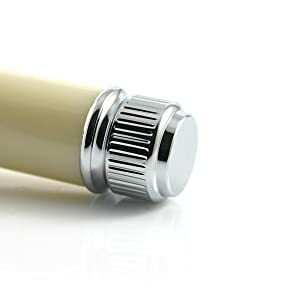 With the circular lathering motion the fine tips of badger hair lift and soften the beard to create a smooth, creamy shaving lather, cleanse and massage the face gently resulting in a comfortable shave. Using a badger shaving brush in the daily shaving routine will enhance the shave quality, improve facial skin appearance and promote a genuine feel good factor. Edwin Jagger Shaving Sets are the perfect gift - or indulgence. The sets are beautifully created using the finest Edwin Jagger designs from our extensive ranges. 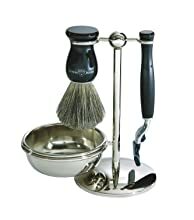 Sets can be created by choosing a matching Shaving Brush, Razor and Stand, together with a Shaving Bowl and other accessories. 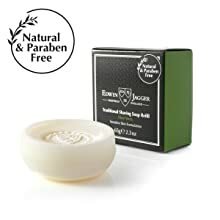 The new range of Edwin Jagger Shaving Creams and Soaps is the culmination of a long period of research into creating the best possible shaving products; we place great emphasis on selecting the very best natural ingredients for our range of traditional hard shaving soaps, premium shaving creams and aftershave lotions, many derived from organically cultivated plants. The luxurious lathering properties of our creams and soaps are enhanced by subtle natural extracts of Aloe Vera & Sandalwood. 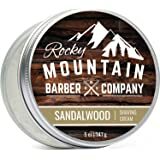 5.0 out of 5 starsAmazing value for a great shave! I have use a large variety of razors and this one is by far the best to date. Due to very sensitive skin along my neck and under my chin I have been trying anything and everything from razors to moisturizers to aftershaves and a large variety of shave gels, creams, soaps, etc. Due to the sensitivity and the razor burn that followed, I would have to wait days to shave again, which made the multiblade razor unable to clear my facial hair without multiple passes, which in turn led to more razor burn. Tried straight razors, and while it might be something that seems cool to do, it takes a lot of time, dedication and learning- not to mention the need to find someone who can hone your blades. I tried a straight that used the same type of blades as any safety razor, and it was ok, but lacked the comfort in hand of a straight razor. Electrics- it looked like I used a belt sander to shave and after spending a tonne of cash on too many electrics that just didn't work, I decided to switch to a double edge as my final kick at the can before resigning to a life of cartridges and the damage that follows. First off- if you read safety and think this means you won't get nicks if you shave like you did with multi-blades, you're in trouble. It's a different technique than the cartridges I grew up with, where you push to have hairs pulled and cut. With a DE you let the wait of the razor and the right angle do the work (and by right, I don't mean 90 degrees, I mean the right angle for you!). 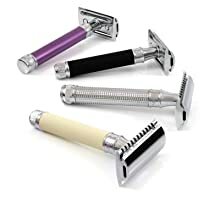 If this is the first time you're using this type of razor, spend a few minutes on youtube. I'm more than a tad leery when it comes to any shaving gear and the reviews and promises that come with them. When I read the reviews on this DE, I was encouraged and the price was well worth the gamble. First shave with the Jagger, not a nick, not a tad of burn. The weight felt great, which leads to trusting it to do the shaving and not returning to the ingrained impulse to push. Very smooth glide across the face and with warm (not hot) water rinses between strokes the entire experience was quick and comfy. There might be a better razor out there, but at this price, I doubt it. The weight, the quality of the build, the packaging, the appearance- everything far exceeds what you would expect out of something at this price. 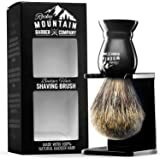 Not only do I highly recommend this to anyone looking for a great value DE, I plan on buying a few to give as gifts for those I know who hate shaving as much as I once did. Great job Edwin Jagger! 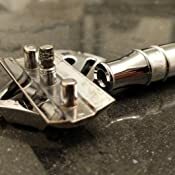 Been shaving in the shower with the gillette mach series razors for decades. 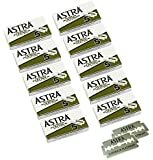 Decided to try a safety razor. So for a few days I did a 1/2 face comparison using the supplied blades. Physical impressions - size of the standard handle is really short and took some getting used too in my average mitts and despite the grooves on the handle it slipped out of my fingers a few times, added an elasticband to the handle for extra grip. Usage impressions - I was hesitant the first few strokes, not sure if I was actually cutting the hair because I didn't feel anything like I do with the mach series. Was expecting it to be at least as if not more aggressive, what a pleasant surprise. 1 stroke each with and against the grain left me a crap load smoother than the disposable without ANY irritation. This is my vanilla razor. 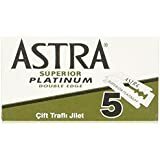 It's excellent, very well built and easy-ish to use but it's still a safety razor after all! 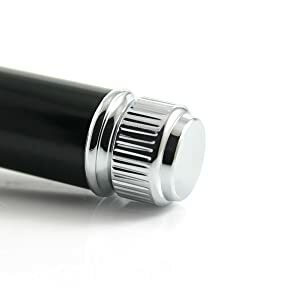 I'm not a huge fan of the smooth black handle and I personally prefer something with a little grip to it. This one glides well when used with good blades and doesn't get overly gunked up with cream. 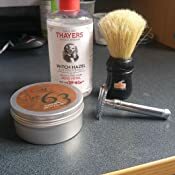 If I need a quick shave, this is my go to. However, if I'm taking my time and want something more aggressive...that's when I use the Muhle R41. That thing is a beast and demands attention. It's NOT the one to use if you're being quick...it'll cut you pretty quick if not paying attention! Purchased this razor a few days ago and I must say this is one of the best DE razors out there. I own a Merkur 37C slant bar and this razor is less efficient but much more forgiving and the longer handle allows for better control. 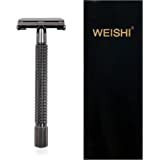 Its heavier than a Merkur 37C or 34C so the weight of the razor does all the work. Pair it with a feather Blade and you'll have the best shave ever. The chrome and finish of this razor is impeccable. The only draw back is if you're removing a week old beard the 37C is the way to go. The spacing between the safety bar in the Merkur is larger which allows for a quicker clean up. 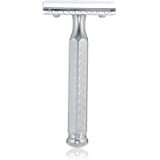 For growths of 3 to 4 days this razor will not have a problem at all. I highly recommend it and it is a razor burn free shave from a guy with sensitive skin. I am switching to Edwin Jagger products from now on. The package did come with a box of 5 Derby blades as per advertising.